Commonwealth medallist Kirsty Gilmour is set to clock up almost 50,000 miles over the next 12 months in a bid to reach the Olympic Games in Rio next summer. The British number one women's badminton player is set to embark on a lengthy qualification process. "The qualifying period for us runs from May until May, 2015 to 2016," she said. "Only the points that you collect in that time matter really, so it's a good bit of pressure." Next month, Gilmour, 21, heads to a training camp in Singapore before the ranking tournaments get underway in Australia. After that, she faces two separate treks to Indonesia either side of visits to America and Spain, all before the end of summer. September sees her competing in Japan and Korea, with the following month bringing trips to Denmark and France, then Germany in November. "I'm looking forward to it and it's quite an exciting prospect, it's quite an exciting period for me," she told BBC Scotland. "It's really nice to have a medium term goal. It's very difficult going to these tournaments with no real aim, so to have a real end goal which you're always working towards. "To spend three days acclimatising, getting used to the hall, hitting in the main arena, it's very mentally draining, but you're always with someone who is in the same boat. "It's difficult to stay optimistic when you can go all the way across the world and lose in the first round. It's difficult to cope with that." 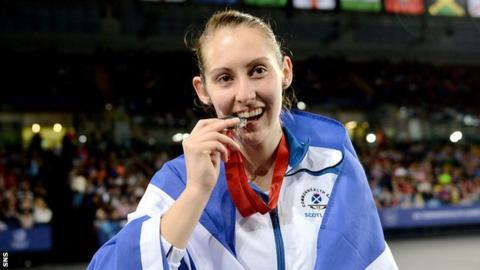 Gilmour became the first Scottish player to reach the women's singles final at the Commonwealth Games in Glasgow 2014 and achieved the highest badminton result in Team Scotland's history when she won the silver medal. "The Commonwealth Games was the biggest thing I've done so far," she said. "It could have gone better but in hindsight I'm just so happy with the way it went. "To get a medal was my aim and goal for two, three, four years. "That was a huge thing for me and it's given me confidence to go on now and know that I can perform in these huge arenas."